For Tiffany Tregarthen, multitasking is not a problem. Between dancing on world stages with Crystal Pite’s Kidd Pivot, co-directing her own company Out Innerspace Dance Theatre, and running a training program for emerging artists, the tenacious 34-year-old is thriving in the pace set by her many roles. When Tregarthen joined the acclaimed Kidd Pivot company in December 2013, it was a pinnacle moment for the Vancouver dancer. “I felt something shoot through my entire body,” she says. “It was a crazy physical experience. My body went technicolour and my whole temperature changed.” Tregarthen was brought on board for The Tempest Replica’s 2014 international tour, taking on the role of Ariel, originally performed by longtime Kidd Pivot dancer Sandra Marín Garcia. In Pite’s contemporary adaptation of Shakespeare’s The Tempest, Ariel is a complex role featuring signature gestural work such as fluttering hand movements, highly nuanced solo material and intricate duet work. To fully understand and interpret any role, Tregarthen first tests the edges of how the movement can be done — practising the material in different scales, with different levels of effort and different tempos. She relates learning the role of Ariel — or any hearty piece of choreography — to an interview. “I will ask the material a million questions — it’s like getting to know someone,” she explains. She has since been involved with Kidd Pivot in the creation and production of Polaris, set to the music of Thomas Adès and commissioned by Sadler’s Wells. 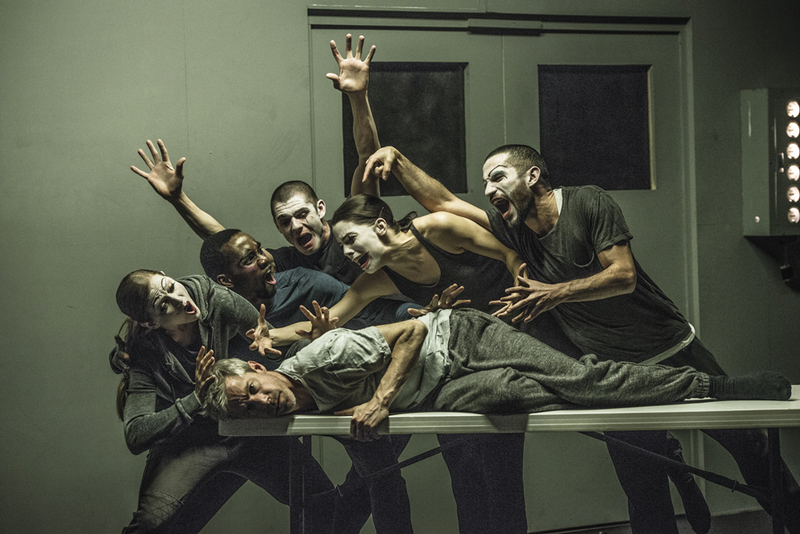 Tregarthen participated in the research and development of the material as one of the dance captains, working with students from three training programs in Vancouver, including her own, Modus Operandi. Then, for the London premiere in fall 2014, she was one of six Kidd Pivot dancers who performed in the large-scale piece featuring 75 musicians and a cast of 64 dancers, bolstered by a substantial contingent of students from the London School of Contemporary Dancers. As well, she recently performed in Pite’s newest dance-theatre work, Betroffenheit, a collaboration with Vancouver theatre artist Jonathon Young, which premiered in July as part of the arts and culture program of the Toronto 2015 Pan Am and Parapan Am Games. Tregarthen’s artistic relationship with Pite crosses over into her own choreographic process with Out Innerspace Dance Theatre. 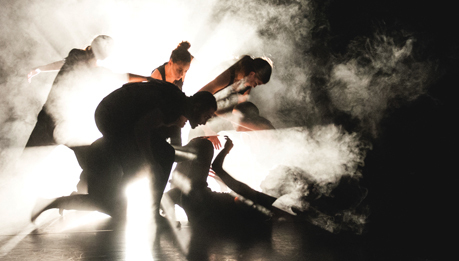 Pite is the project mentor for the company’s new ensemble work, choreographed by Tregarthen with her Out Innerspace co-director (and life partner) David Raymond. In Tregarthen and Raymond’s choreographies, there is anemphasis on characterization and incorporating multiple elements such as video projection, text, distinct lighting design and soundscapes to create very specific environments. Pite is known for richly layered theatrical productions, making her an ideal mentor in terms of style. But for any young company, Pite is a deep well of inspiration. The new, still untitled Out Innerspace work (set to premiere in January 2016 in Victoria, British Columbia) features seven dancers, including Tregarthen and Raymond, who bring to life a cinematic world that exposes the strife between three communities. The performers in each are defined by their unique movement language and costumes, including head-to-toe striped onesies, ski masks, dark clothing and exaggerated contour-face painting, to both conceal and reveal their true character. They are transformed into what Tregarthen refers to as “players in a world conflict, fighting for power over their own domain — the territory of the theatre — both physically and psychologically.” Also present in the theatre space, like an eighth member of the cast, is a PT Zoom surveillance camera, monitoring offstage activity and projecting the images back into the performance arena. The choreography, some of which was shown recently in process, is a mix of set material and improvisational structures, supported by a musical score of live, distorted vocals amplified through a vintage microphone and by the suspenseful sounds of Bernard Herrmann’s overture for Alfred Hitchcock’s film North by Northwest. In one group section, the ensemble is a mass organism of tangled limbs that builds, unravels and builds again while travelling to different parts of the stage. Never quite separating, the group morphs shape through improvised sequences of interlocking bodies that create dynamic tableaux depicting events from the past, present and future. The work illustrates Out Innerspace’s signature combination of whimsy and skill. Out Innerspace recently gained success with its quirky, manga-styled duet Me So You So Me, co-created and performed by Tregarthen and Raymond, which went on its second national tour this past year. Martha Schabas in the Globe and Mail praises the standout duet, noting that “despite its radical range of movement and narrative technique, nothing ever feels superfluous. Every wild diversion is productively part of the whole.” Tregarthen has also made work for Les Grands Ballets Canadiens de Montréal as one of the winners of the National Young Choreographer Competition in 2008, and for schools such as Ghent Conservatory and Dansstudio Arabesque in Antwerp. From a young age, Tregarthen was serious about dance both as a performer and creator. “I was continuously looking for possibilities and answers for how I could do more,” she says. Originally from a small town in northern British Columbia, Tregarthen’s early dance training began in jazz, and then expanded to include other forms, with a strong focus in ballet. Tregarthen’s professional career took flight in New York City, where she moved in 1999, working with artists such as Wes Veldink, and performing and touring with Mia Michaels’ R.A.W. After missing Michaels’ audition, the intrepid 18-year-old sought out the So You Think You Can Dance choreographer in Seattle, took her classes and commissioned a solo. “I didn’t actually need a solo, I just wanted to work with her,” she says. Michaels soon asked the bold young woman to join her company. A few years later, Tregarthen was invited for an eight-month residency in Seoul, South Korea, to work with Poz Dance Theatre, performing and choreographing for the contemporary jazz company while also guest instructing at Hansung University. The duo’s collaborative partnership began in 2004, when Raymond asked Tregarthen to be one of four dancers in a series of solo studies he was creating for a cultural event in Vancouver. Their artistic relationship crystalized during a two-year research and creation residency at Antwerp InternationaleDansstage in Belgium from 2005 to 2007. The residency was an opportunity for Tregarthen and Raymond to establish their own movement language and dance practice. They would go into the studio working independently on opposite sides of the room, asking themselves questions like: When I go in the studio by myself, what is my process? What is my preparation? How do I keep my momentum going? How do I build on what I have learned? What do I do when inspiration strikes? Developing their own working method was essential preparation for building a dialogue and process as collaborators. Through their individual and collective research, the seed of Out Innerspace Dance Theatre was formed. Now heading into its ninth season, the company has built success on Tregarthen and Raymond’s continued curiosity and endless questioning. Out Innerspaceis home their creative pursuits as well as their pre-professional dance-training program Modus Operandi, which has evolved into a multi-year curriculum dedicated to research and creation in dance, and dance on film. “I feel like everything I’m doing is fuelling and directing how I go about each aspect in my career,” says Tregarthen. The possibility and discovery she finds from dancing in Pite’s work feeds her choreographic process with Out Innerspace. Inspired by these creative experiences, she immediately wants to share what she’s learned with her students, and witness them make their own breakthroughs. With this intertwined collection of activities, Tregarthen reaps the rewards of a dance career that thrives in the space between balance and risk-taking.